The Porsche 356 was very much a father and son design effort with Dr. Ferdinand Porsche senior initially creating the Type 64 around 1938 with the intention of building three cars to compete in the planned 1939 Berlin-Rome road race, and the three competition cars were indeed built however the situation Europe forced the cancellation of the race. Of the three Type 64 cars only one survived the war and it remained in the ownership of Dr. Ferdinand Porsche’s son Ferry. The Type 64 was very much the design concept taken from Dr. Porsche’s design of the “KDF Wagon” which would later come to be known as the “Volkswagen” or “People’s Car“. The horizontally opposed four cylinder air cooled boxer engine is very much a Dr. Ferdinand Porsche design. During the war Dr. Ferdinand Porsche worked on military design work including many of the German tanks and at war’s end he was interned by the French in conditions that did not help the health of the aging engineer. It was in 1951, not long after his release, that Dr. Ferdinand Porsche passed away leaving his son Ferry to take the helm of the family company along with his sister Louise. Ferry Porsche began his design for the new Porsche sports car with a mid-engine design which was called the No. 1 simply because it was the first prototype car to bear the Porsche name. 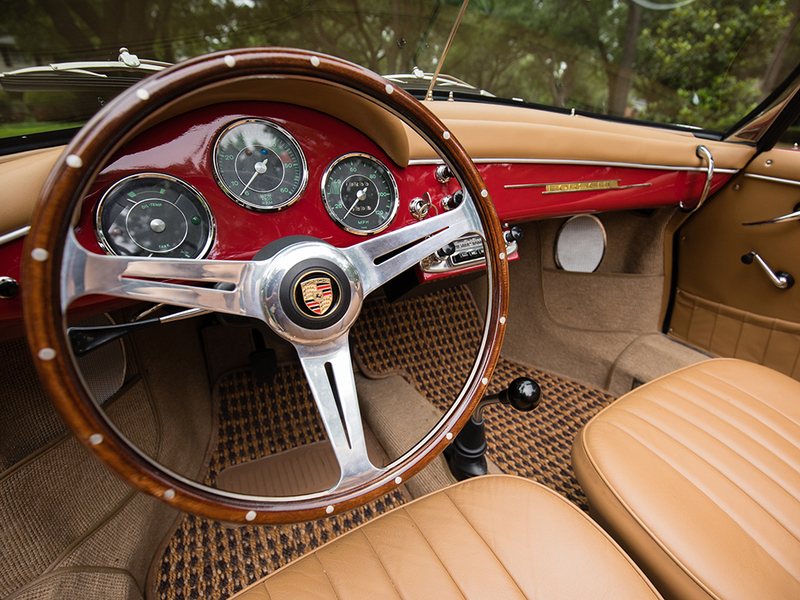 Although originally intended to be a mid-engine sports car Ferry Porsche came to the conclusion that his father’s preferred rear engine layout was more practical providing room for a folding hood or a pair of seats behind the driver and passenger. Ferry Porsche realized that although the mid engine had been the preferred layout for the Auto Union racing cars of the thirties yet in building a practical road going sports car his father’s rear engine layout provided room behind the front seats for either a pair of occasional seats creating a 2+2 or for a folding hood for a convertible. An additional advantage of the rear engine layout is that it enables the engine and transmission to be dropped out of the car and repaired or replaced relatively easily. So Ferry re-designed the No. 1 using the basic layout and construction principles as his father’s design for the Volkswagen. It was a design that would not only prove itself to be a world beater but it was also a design that was sturdy and able to be economically manufactured. The disadvantage of the rear engine layout is that luggage carrying capacity is limited to the area ahead of the fuel tank over the front suspension. But the rear engine allows additional space behind the front seats. The Porsche was a complete re-design using the unitized pan and body construction with a new streamlined body created by Erwin Komenda. The design used suspension and some other parts that were, at least for early models, from the Volkswagen, including the engine casing. In many respects Ferry Porsche’s thinking was similar to Carlo Abarth’s ideas and the two would combine forces in the creation of some Porsche Abarth competition cars. That thinking was to make the car lightweight so it enjoyed an equal or superior power to weight ratio by comparison with heavy sports cars but with the advantage of agility and lively handling. Behind the wheel is where the action happens. The interior layout is practical and aesthetic. Instrumentation is directly in the driver’s line of sight. The wood rimmed alloy steering wheel in this car is a tasteful and practical item. 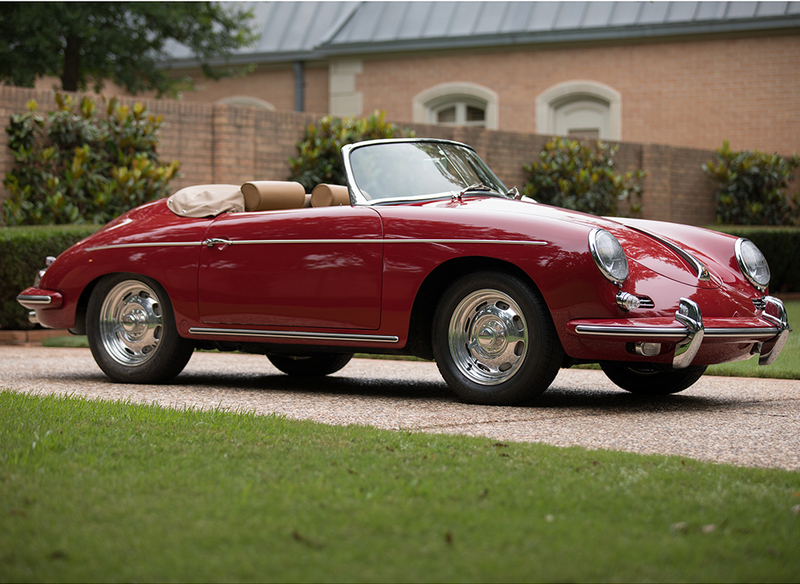 The first Porsche 356 featured an aluminum body and was on the road in 1948. The earliest cars were produced in Carinthia (Gmünd) in Austria with aluminum bodywork but when Porsche moved operations to Zuffenhausen in Germany in 1950 the bodywork was changed over to steel construction partly to keep costs affordable and also to keep the bodywork durable. Between 1948 until 1950 only about fifty cars were made. 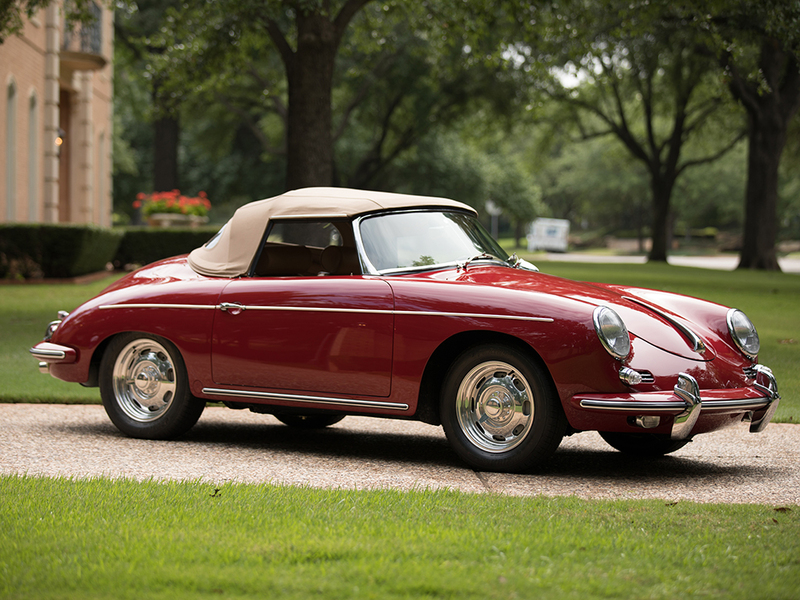 The styling of the 356 is pure aerodynamics which has given the car a timeless appearance. As a consequence the design of the car lasted into the 1960’s only to be replaced by the equally timeless 911. Note the exhaust pipes are integrated through the bumper over-riders. The 356 remained largely unnoticed by the world until one was entered in the 24 Hours Le Mans for 1951 and came away with a class win. Owners of Porsche 356 automobiles were entering them in race and rally competition and the little car was fast building up some “street cred“. By 1953 Porsche gained some notable “street cred” in the Carrera Panamericana road race which crossed Mexico starting at the Texas border. A Porsche 356 piloted by José Herrarte from Guatemala won the small car class. So when Porsche introduced their new four cam engine in 1954 they called it the Carrera, a name that Porsche has adopted ever since. 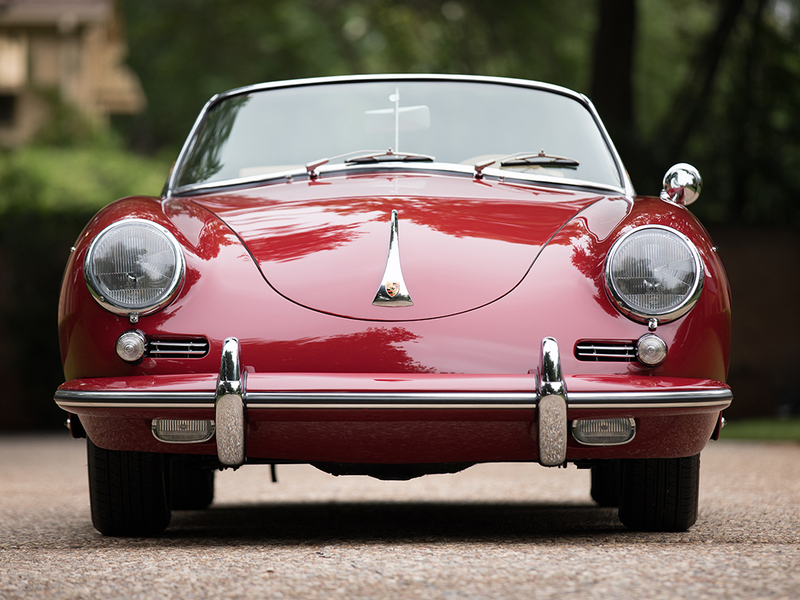 The Porsche 356 looks are unmistakable and quite unique, attributes that helped make the car recognizable in competition worldwide. 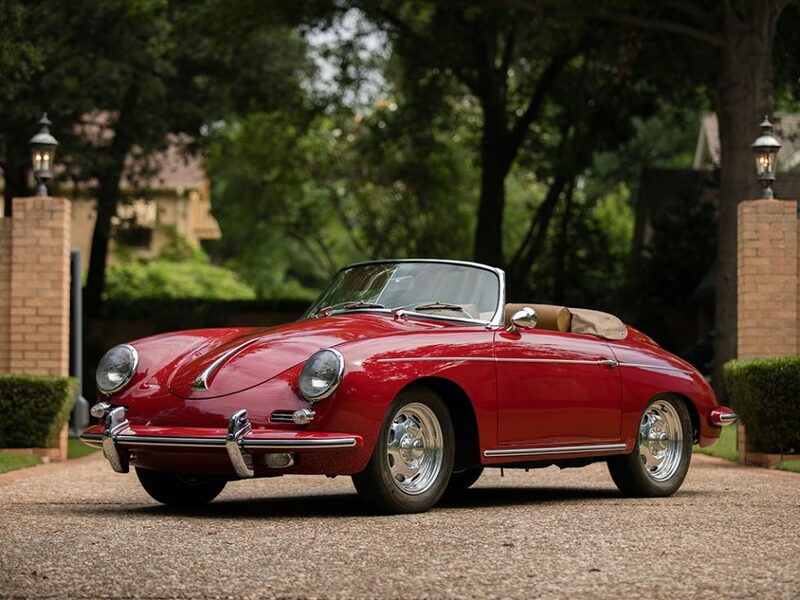 By 1955 Porsche were exporting the 356 to the United States and the Speedster open top stripped down version was created on the suggestion of the US distributor for Porsche. Once in production the Porsche 356 went through many technical advances whilst the external appearance of the car remained largely unchanged. 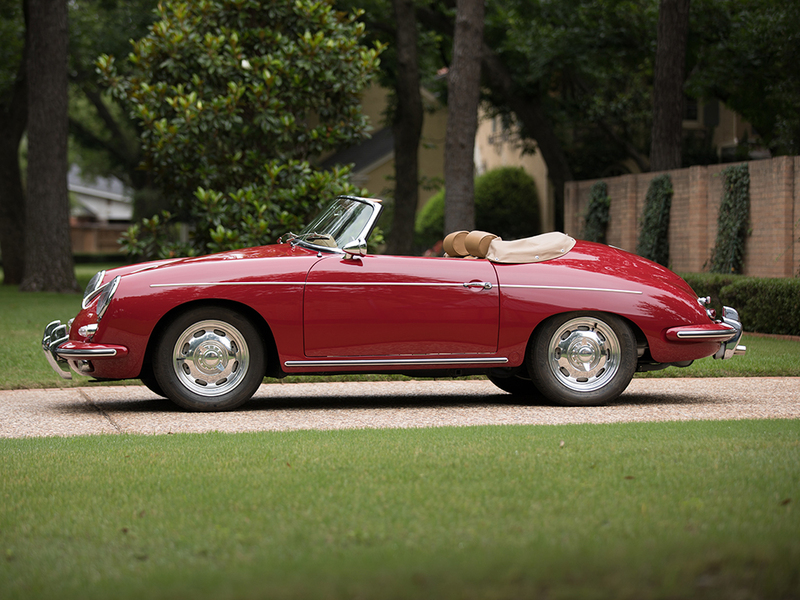 The first series were the 356 A which were made from 1955–1959 with 1.3 liter, 1.5 liter and 1.6 liter engines. 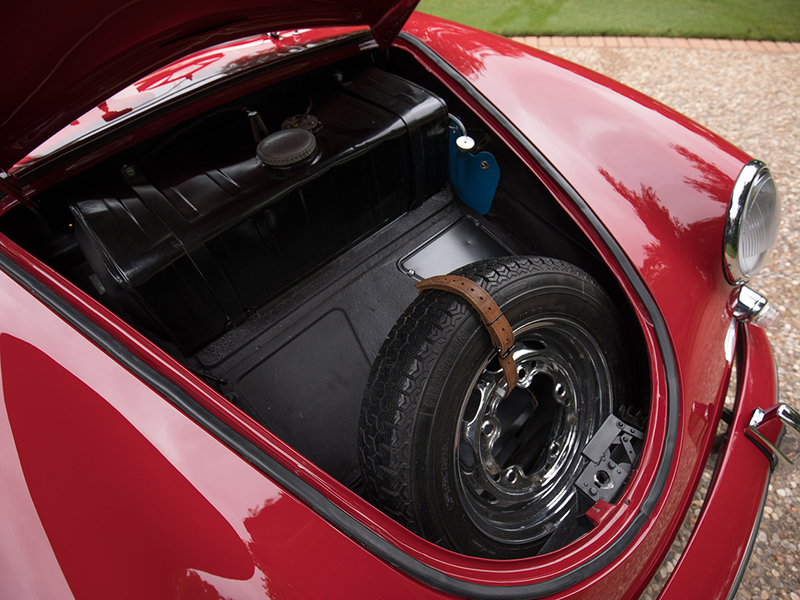 The 356 B followed on from this being made from 1960-1963 and fitted with 1.6 liter and 2.0 liter engines with the option for Alfin (Aluminum Finned) drum brakes. 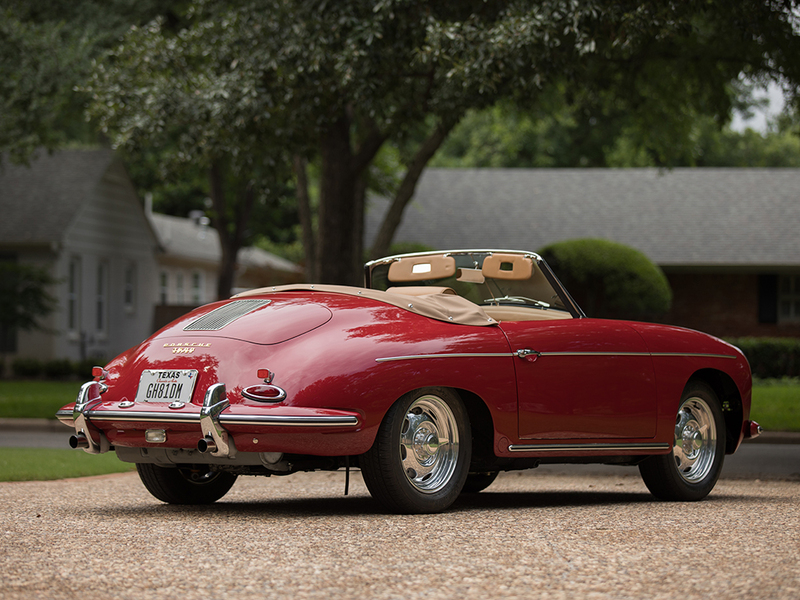 From 1964-1966 the 356 C was made the most important improvement in it being the fitting of disc brakes on all wheels. Porsche 356 B with top raised. 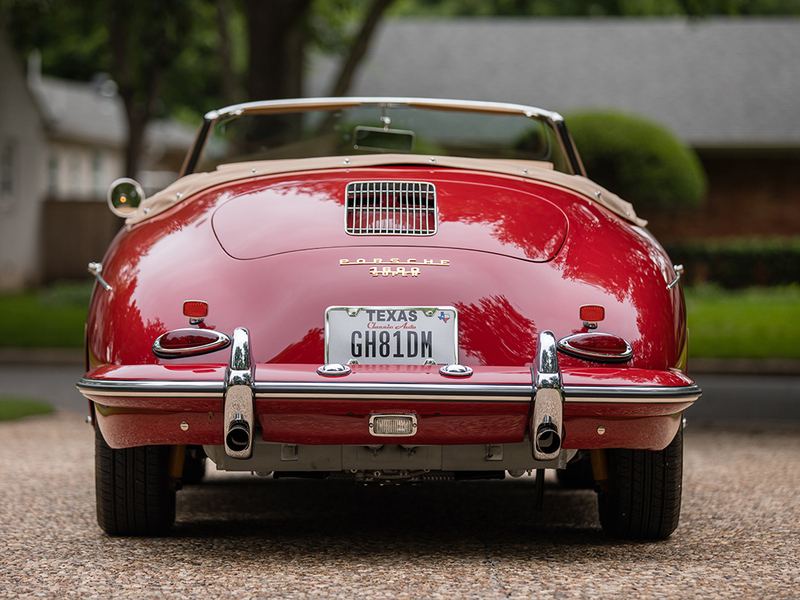 The Ruby Red with light tan trim Porsche 356 B in our photographs is a numbers matching fully restored 1960 model fitted with Alfin drum brakes all around. The car was completed on July 14, 1960, and was kept original and rust free until its 2013 restoration. The car is supplied with two sets of wheels; the original steel set, and the knock off reproduction set fitted with high speed rated radial tires. 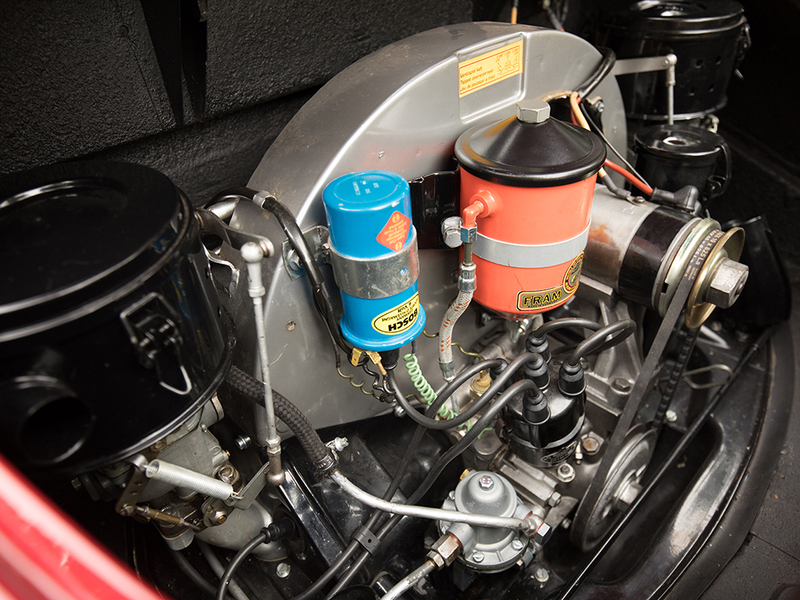 The car has been subjected to a top quality restoration with great attention to detail. This car is coming up for sale by RM Sotheby’s at their Santa Monica auction to be held on June 24th, 2017. The car is very much a collectible driver’s car and as such promises great enjoyment for its new owner.